This summer and fall, New York City urban agriculture advocates saw our city take an initial step in joining other visionary cities like Boston, Los Angeles, Chicago and Atlanta to bring together the long-standing work and wisdom of individuals and groups growing food in community gardens, rooftops, schools and other spaces to create a path towards long-term resilience, economic opportunity, food security, health and community sovereignty for all New York City residents. On July 20, 2017, Brooklyn Borough President Eric L. Adams and City Councilmember Rafael Espinal (D-Bushwick, East New York) introduced Int. No. 1661 to create a comprehensive urban agriculture plan for the city. In October, dozens of advocates gave input and testimony on the bill’s vision and planning process, encouraging the city to bring together everyone with a stake in New York City urban agriculture to create the plan. (iv)          other existing business resources relevant to urban agricultural businesses available from city agencies. (iii)          information on how produce grown on-site at community urban agriculture sites can be distributed within communities. §2. This local law takes effect immediately. Much of the initial lobbying that sparked Brooklyn Borough President to introduce the original bill came not from the long-term gardeners and local food advocates, but from relative newcomers to the work of growing food locally: Brooklyn’s growing number of private sector entrepreneurs who wanted clarity and easing in regulatory hurdles and new incentives for launching new, often indoor, urban agriculture start-ups in industrial spaces around and near the city. Indeed, news of the proposed urban agriculture plan spread beyond local or usual food or environmental publications to include those covering Wall Street, food tech and venture capital/angel financing trends. Large investors have begun to see great profit potential using rooftop and indoor agriculture to grow food with high yield and low input. For example, according to a recent Center for Urban Business Entrepreneurship (CUBE) at Brooklyn Law School study, New York City has about 14,000 acres of unused rooftop space, which could grow enough produce that could feed as many as 20 million people in the New York metropolitan area. And the influx of new indoor vertical farm startup firms arriving in this city popping up around the city just taps the surface of the vast potential for using hydroponics, aquaponics and other high-tech methods to grow food indoors. So when the bill suddenly landed on the Council’s Committee on Land Use’s October 26 agenda, urban agriculture advocates attended to ensure that any plan include the on-the-ground experience and expertise of those who have led the way, and the voices of those whose needs the plan seeks to address. Forty-six people, representing individuals and organizations involved in food and urban agriculture, including NYC Foodscape testified at the hearing to provide information and advocate for an effective and robust plan that would support the vast entrepreneurial, food access, environmental and public health potential of urban agriculture. 6) assess the feasibility of creating an office of urban agriculture. At the October 26 hearing, NYC Foodscape testified in general support of the original bill’s plan, though asked the council committee to ensure that the process was transparent and equitable. To create an effective plan, the planning department needs input from and engagement with all stakeholders, from residents and citizen groups, gardeners, community-based organizations, health providers, housing providers, educators, entrepreneurs, philanthropists and advocates, to properly delve deeper into specifics of the plan: 1) choosing the best options for creating urban ag zoning ordinances, 2) assessing and removing as appropriate, any land use, building department, health code and other administrative or bureaucratic barriers; 3) exploring and developing a broad range of incentives and resources that can help make these spaces productive and viable; 4) tapping into the knowledge and experience of existing community, backyard and rooftop gardeners and farmers, including our youth and educators; and finally, 5) ensuring that the plan is equitable and gives New York City residents in all communities—especially those who need them the most–an equal and increased share of the land access and tenure necessary to grow their own food and retain some degrees of sovereignty over their food system. (For NYC Foodscape’s full testimony, scroll to bottom). NYC Foodscape agrees. Achieving the potential that urban ag has for truly improving the lives of residents translates into helping provide fair and feasible access to land and other resources to individuals, nonprofit food organizations, and entrepreneurs who know how to and want to grow food in New York City. The economic, environmental, health and community resilience benefits that having farms, gardens, rooftops and other places to grow food provide–especially those in outdoor open spaces using healthy soil and those in, for and by underserved communities–can’t be overstated, and are well-researched and supported with evidence. Increasing access to fresh healthy food, reducing monthly food costs and improving resident health; Teaching basic vocational skills; Beautifying communities; Encouraging self-reliance along with important civic behaviors such as water conservation, waste reduction, and recycling…these are just a few of the proven benefits that growing food in a city can provide. Given the large financial investments and interest that Wall Street equity and venture capital groups have in urban agriculture, already existing disparities in terms of access to funding, influence and policy making will surely grow wider, and long-term practitioners and advocates may find themselves shut out of the opportunities and many benefits that growing food for their communities provides. City support for urban agriculture should include not only commercial urban agriculture, but also those spaces at the forefront of growing food in this city, community gardens, school gardens, permaculture gardens, vertical farms, and all other forms of gardening and farming practice. You can find more information on Int. No. 1661’s full history, including NYC Foodscape’s and other organizations October 26 testimony on the bill’s page on the City Council website. Good morning. I am Carolyn Zezima. I am the president and chief consultant for NYC Foodscape, a food systems & urban ag consulting business and blog. I want to express my general support for the proposed comprehensive urban farming plan creation process you are considering today, but will have some comments on the process. To begin, I commend the Council as a whole and specifically, Council Member Espinal and Brooklyn Borough President Eric Adams for taking this visionary step towards building long-term resilience, economic opportunity, food security, health and community sovereignty for all New York City residents. By way of quick background, I am a lawyer, turned professional chef, turned urban farm founder, advocate and consultant. I have launched, managed, planned and/or assisted in implementing at least seven successful urban farming and youth gardening projects in Chicago and New York City in the past eleven years, including starting an urban farm and environmental learning center in 2006 in Evanston, Illinois called The Talking Farm. And in New York, partnering with numerous community organizations and settlement houses, including serving as technical advisor to help plan and install the Battery Urban Farm’s inaugural 2011 season and advise participating schools and community groups about gardening techniques and food production. But the New York City urban ag project I’m most proud to have spearheaded and still manage regularly is the Children’s Workshop Garden at Campos Community Garden in the heart of the East Village on E. 12th Street near Avenue C. The children’s garden was created in 2013 in the wake of Hurricane Sandy’s destruction after Campos Garden lost nearly everything to the devastating surge from the East River that accompanied the storm. To help the garden recover, our neighbor, Children’s Workshop School, went out of their way to obtain a Citizen’s Committee grant on our behalf and on students urging, because the students loved walking by and seeing it every day on their way to school and didn’t want to lose it. In gratitude, we decided to use the funds to start a children’s garden for all our community’s children’s benefit. The garden is a permanent therapeutic and safe space that produces hundreds of pounds of diverse produce and herbs each season and features a gorgeous herb spiral in its center. We just finished our fifth season of growing food, engaging the community and teaching and feeding kids from local schools, local youth organizations like the Boys Club, summer camps and group homes. This season culminated a couple of weeks ago with our very fun Garden Mystery basket program. 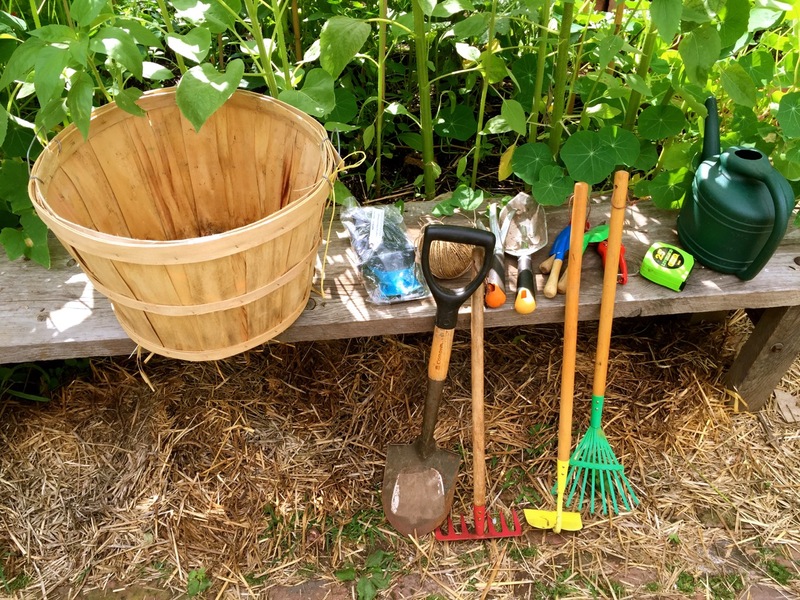 Teams of third graders opened surprise bags of various combinations of produce and herbs that grow in our garden, and then working together, brainstormed, prepared, named and “styled” a dish designed not to feed themselves, but to feed the other teams. It was an amazing example of seed to plate, using almost every skill, including cooperation and teamwork, that a young person needs to develop into a self-sufficient, healthy and engaged citizen. Thanks to this Council’s earlier forward-thinking legislation that has supported the use of city-owned and other vacant land for urban farming, and the work of nonprofit and for-profit entrepreneurs and community organizations, New York City neighborhoods have enjoyed a significant increase in urban agriculture in recent years. Brooklyn Grange, East New York Farms, Eagle Street Rooftop Farm, La Finca del Sur in the Bronx, as well as the projects I ‘ve worked on and mentioned above, are just a few varied examples of successful and diverse types of early urban initiatives that grow a lot of food, engage the community and provide education about gardening, farming and food production. I wrote a book last year about sustainability in affordable housing that included chapters on food access, community gardens, urban farms, and green roofs that prominently featured the good work in this area by New York City housing providers, such as NYCHA, Related Companies and Workforce Housing, who have begun to use land at their sites provide urban farming, gardening and other food access opportunities for residents at their sites, created with the help of local food and community garden organizations that work with them. Indeed, for decades, NYCHA in particular, with its Greening and Gardening program, as well as its recent partnership with urban farming organizations to create viable urban farms at its sites, has been an example for other housing authorities around the country to follow. These are the kinds of projects that I think epitomize some of the current and potential economic, environmental, health and community resilience benefits that having farms, gardens, rooftops and other places to grow food provide. These benefits–especially those in outdoor open spaces using healthy soil and those in, for and by underserved communities–can’t be overstated, and are well-researched and supported with evidence. Increasing access to fresh healthy food, reducing monthly food costs and improving resident health; Teaching basic vocational skills; Beautifying communities; Encouraging self-reliance along with important civic behaviors such as water conservation, waste reduction, and recycling…these are just a few of the proven benefits that growing food in a city can provide. But these wonderful projects I mentioned just touch the surface of the potential we can achieve in this city. We need more community-based as well as small commercial urban farming enterprises and more opportunities generally for growing of food in the city to meet the growing challenges our city faces in the future. As a critical mass, the amount of food we can grow in relatively small spaces around the city can be quite significant: A study of out of Newark found that 1,900 community gardens totaling 30 acres produced approximately $915,000 of food value in one year and almost $4 million over 4 years. Taking this to our own city, as one eponymously named organization estimates, there are 596 acres of city-owned and leased vacant land available in Brooklyn alone, and according to Urban Design Lab estimates, at least 5,000 acres of public and private vacant land that could be used to grow food citywide and 3,000 acres of appropriate rooftop space…think of the exponential dollar value that the Newark study’s estimates total in New York City numbers in terms of the amount of food production, job creation and food security. Beyond the economic considerations, urban farms and gardens are essential in other aspects of our city’s resiliency plans. Since Superstorm Sandy wrought its destruction in 2012, many forward-thinking people in the city’s administration, and in groups and projects such as Gardens Rising, in which Campos Community Garden proudly participates, are looking for ways to increase the city’s resilience to climate change-related storm events, including mitigating the impacts, damage and water pollution from storm surges and from peak and combined sewer overflows. Gardens and farms—indeed, any green space with compost amended soils, as well as green roofs, are proven tools for achieving those goals. For example, numerous studies show that gardens and properly installed green roofs significantly reduce the quantity and improve the quality of stormwater that enters our waterways. Additionally, gardens and urban farms, both on the ground and on roofs, can help mitigate the increasing detrimental impacts from the so-called “heat island effect” that large cities like ours experience as global temperatures rise by cooling the surrounding areas and improving the air quality. Achieving the potential that urban ag has for truly improving the lives of residents translates into helping provide feasible access to land to individuals, nonprofit food organizations, and entrepreneurs who know how to and want to grow food in New York City. From my real-life experience launching the Talking Farm in Evanston and my work here in New York City, I understand how difficult it can be for small food and farming enterprises, let alone resident groups, to find suitable land for growing food, and how important and powerful a resource and partner city governments can be in supporting local food enterprises and resident groups find land and plan their garden projects and urban farming businesses. Every piece of land is unique and it is essential to know the specifics of a site in order to then determine whether it is suitable for urban agriculture and to what extent, and what resources are needed to make it healthy and productive. The proposed plan here today supports the development of additional innovative urban agriculture initiatives, food-producing community gardens and rooftop farms by pinpointing where there is vacant and appropriate land suitable for food production and exploring the policy and other considerations might make land use for agriculture more viable and accessible to those who wish to farm it. In closing, the entrepreneurial, food access, environmental and public health potential of urban agriculture that this plan could lay the groundwork for is vast. The bill’s plan brings with it many areas that needs input from and engagement with all stakeholders, from residents and citizen groups, gardeners, community-based organizations, health providers, housing providers, educators, entrepreneurs, philanthropists and advocates. The plan will need the on-the-ground experience and expertise of those who have lead the way, and hear from those whose needs the plan seeks to address to delve deeper into specifics of the plan: 1) choosing the best options for creating urban ag zoning ordinances, 2) assessing and removing as appropriate, any land use, building department, health code and other administrative or bureaucratic barriers; 3) exploring and developing a broad range of incentives and resources that can help make these spaces productive and viable; 4) tapping into the knowledge and experience of existing community, backyard and rooftop gardeners and farmers, including our youth and educators; and finally, 5) ensuring that the plan is equitable and gives New York City residents in all communities—especially those who need them the most–an equal and increased share of the land access and tenure necessary to grow their own food and retain some degrees of sovereignty over their food system. Again, I urge the Council to undertake this bold and visionary plan. I would be happy to work with you and give continued input to develop this plan further as it progresses. Thank you again for letting me speak.